A beautiful landscaping feature that is increasingly inquired about is a decorative stone wall. But don't let the word "decorative" deceive you - most of the stone walls we construct serve both an aesthetic and functional purpose, and can make your front or back yard or commercial property both a stunning view and an extremely functional landscape. When you see a stone wall, unless you're an experienced landscaper, you may be underestimating the amount of work that went into the creation of that wall. Every good stone wall, also known as a rock wall, has to have a good foundation. A deep trench with appropriate drainage starts the project, followed by a frost-resistant foundation made of solid stone. Especially in this region, frigid winters can wreak havoc on stone walls, so assuring the proper usage of materials to combat this is an important step. From there, breathable landscaping material is installed around the foundation of the stone wall to protect against organic, decaying soil. The next step is the actual construction of the decorative (and functional) stone wall. For this step, we'll carefully consider your input and aesthetic desires. 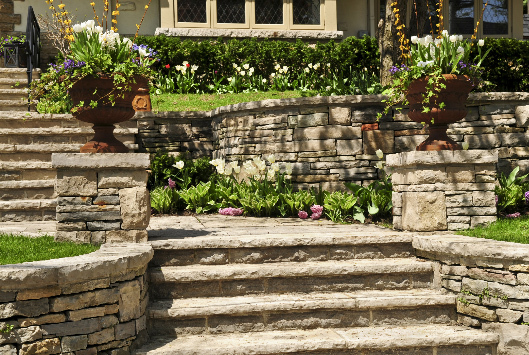 Whether the wall is smaller, like borders for flower beds, or much larger, like big retaining walls that level out our yards, we'll take into account things like the design and architectural features of your home, the native stones and rocks, colors in your current landscape, and of course, function. Once we've mutually agreed on the best stone selection for you, we'll obtain the stones, and begin dry stacking. We'll make sure the stones are solid, so as not to cause future property damage or bodily harm. And last but not least, we'll take pride in every last step of our work, assuring that you are happy, your property is more beautiful than when we began, and that you'll recommend us to your friends and family. We take an immense amount of pride in our work, and we have an immense amount of respect for your property. Count on our company to construct your functional, decorative stone wall or rock wall.